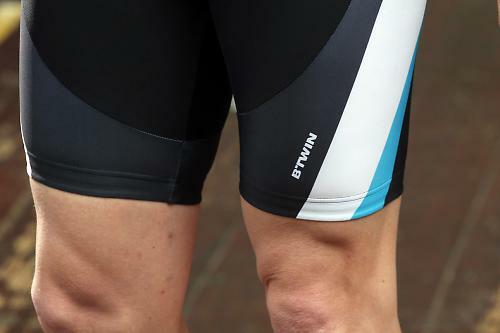 Btwin's Bib Shorts 500 are designed for 'Road cyclists on challenging rides of average duration', which is another way of saying they're a great choice for training, club and general riding - at a penny shy of £25 they are easily the best budget bib shorts I've ever worn. They're available in a choice of two colourways (black/blue or black/white) there's nothing particularly exotic in terms of materials or construction, but you wouldn't expect that at this price. Polyester/Elastane mixes are pretty standard; although the 500 seem thinner than some of the competition. On the plus side, this makes for a pleasingly seamless effect when worn and together with the ventilated mesh makes for an extremely temperate inner climate on warmer days or during indoor trainer slavery. On the other hand, they might not fare quite so well in a spill - but then they are £25. Flat seams contribute to comfort and silicone leg grippers hold everything in situ. Sizing is broadly on par with everyone else's, taking the guesswork out of virtual purchases, though my mediums were slightly shorter in the leg and the braces at a slightly unusual angle. These make slipping in/out a wee bit more awkward but weren't remotely restrictive, whether hunkered low on the drops or discretely answering nature's call (nice image - ed). The pad is the greatest influence upon rider comfort and while bad ones are thankfully rare, we're all anatomically different. Decathlon says this one is an odour repelling, anti-bacterial mix whose component parts boil down to medium density polyurethane, polyamide, polyester and elastane impregnated with silver chloride. Initial impressions were a little mixed when I first put them on - the pad hovered quite obtrusively, though thankfully it took all of five minutes saddle time to mould to my contours. Minor misgivings aside, these shorts have quickly become firm favourites for training and everyday road riding. A succession of 12 mile circuits on my Holdsworth impressed with unrestricted movement allowing a consistent 100rpm. No problems arose when alternating between pursuit and tri bars and the pad offered ample support in all the right places. Extending distances and duration on different bikes proved similarly rewarding-sometimes more upright riding position can cause soreness/chafing - well, it can for me, but I've cruised along contentedly for several hours on my cyclo crosser and Univega alike. Past 50 miles or so, and shorts with higher price tags and more prestigious pads start gaining an upper hand, though these still kept me arid and bereft of socially awkward odours throughout and you can't really ask more of a pair of shorts than that. Bargain shorts for training and everyday road riding that will keep you "arid and bereft of socially awkward odours"
"Ideal bike bib short for cyclists moving towards regular road cycling. Preformed, breathable pad with an antibacterial treatment". No quibble here. Probably the most comfortable budget shorts I've ever used. Generally seems good, though not sure how they'd fare in a spill. These have proved to be an extremely versatile and moreover comfortable bib short for most road applications and their thinner density is likely to prove particularly useful for indoor sessions on the turbo. Braces were an interesting cut but something I quickly adapted to. Really good shorts for the money, probably worth a bit more than an 8 but very minor niggles - which might not be niggles for you - keep them just short of a 9. "arid and bereft of socially awkward odours"
Have to agree with the review, I've been wearing the earlier version of these (the pad is the same) for several months now and really can't fault them. Fit and sizing is good, the quality is perfectly acceptable for the price, and the pad is as good as that on a pair of Gore bibs I've got that cost three times as much. so what size for a 32 inch waist do you guys think? S/m? Can we have a picture of the pad please? I'm 6'1" with about a 36 inch waist and I got a large. Seems to fit me well. Medium will probably be ok for you (depending on height). Just brought a pair of these going off the review. Only just tried them on to check size and all I will say is I got medium im 5ft 9 65kg 32inch waist and they are very snug.i brought the all black version as they were reduced to £20.